TODAY: new remarks by the Transport Commissioner appear to suggest a harder line is being taken on the upcoming German ‘foreigner vignette’ – or do they? A Chinese company offers to build a tunnel under Crimea’s Kerch Strait rather than a bridge as originally planned. The road surface is being blamed for a deadly bus crash in Norway today. Spain plans to give special passes to people crossing the Gibraltar frontier on a regular basis. A Romanian couple drift their way up Transfagarasan. GIBRALTAR FRONTIER WATCH: quiet overnight and this morning; up to 60mins at 14:00, quiet subsequently then 2h30 at 22:30. CALAIS TRUCKS MIGRANT’S PETITION: 2,869 signatures since 15.7. See @Justice4Trucker. But Austria may be grasping at straws. 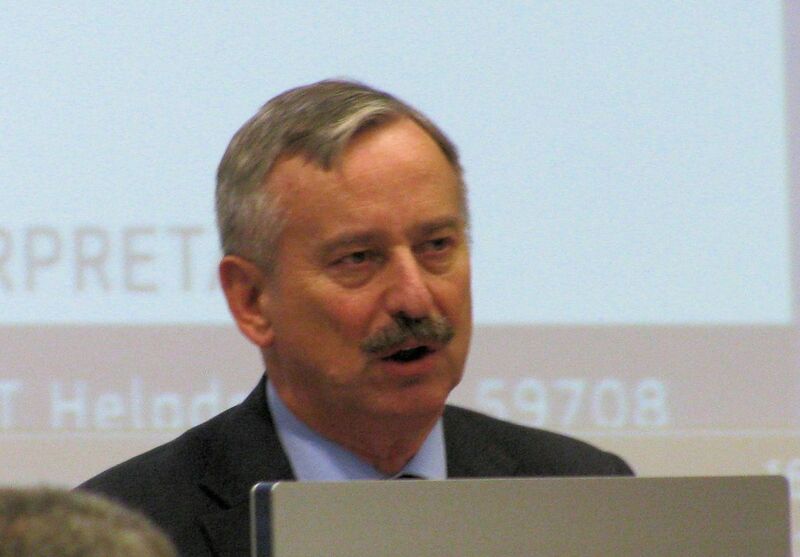 Parting Shot: the European Commssion’s outgoing Transport Commissioner Siim Kallas. A recent article in a shipping magazine called him ‘non-interventionist’. According to the DVZ interviewer, he is known by some in Brussels as ‘a man who promised much but delivered little’. Either way, Kallas seems determined to have a final word on the German ‘foreigner vignette’. Remarks from the European Commission’s outgoing Transport Commissioner seems to suggest a new, harder line is being taken on the German ‘foreigner vignette’. In an interview with German transport magazine DVZ published yesterday, Siim Kallas said the new toll has ‘absolutely not’ been approved by the Commission, and that there should not be a direct link between the toll and the corresponding tax rebate for German drivers. In any case, Kallas leaves his post in the next few months. Whether or not any action is taken against the toll will be down to his successor. That may well depend on which country the new transport commissioner comes from. Also – the man behind the man behind the foreigner vignette – Bavarian CSU party leader Horst Seehofer – said at the weekend that the governing coalition could be at risk if the toll plan failed in Germany. Seehofer famously made the toll a deal-breaker during last year’s general election. It was subsequently written in to the coalition agreement. As part of the bargain his sidekick from Bavaria, Alexander Dobrindt, was made transport minister. 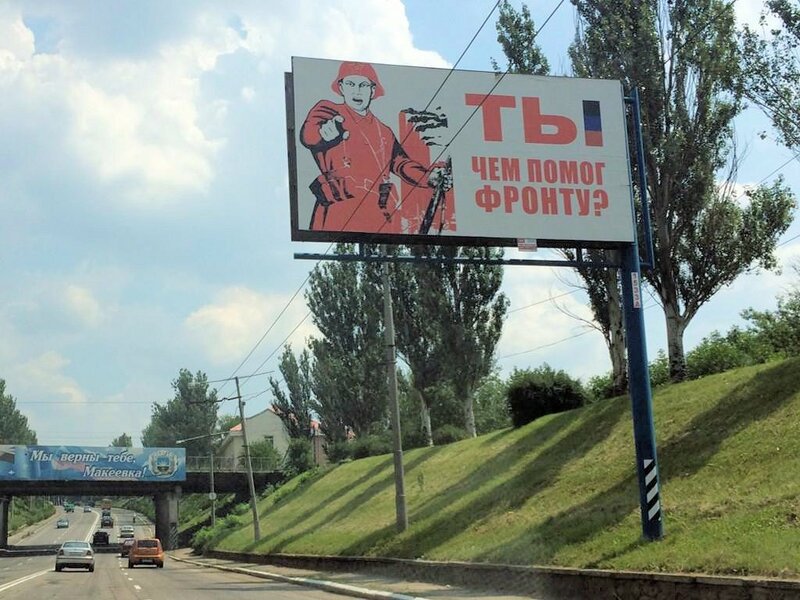 A roadside rebel recruitment poster in Donetsk, east Ukraine. Photo via @KiritRadia. Meanwhile, disturbing news from Crimea last week where it was announced that prisoners will help build the Kerch Bridge from Russia. Reminiscent of the Stalin-era ‘Road of Bones’ Kolyma Highway in east Siberia where fallen prisoners were buried under the advancing highway. However, according to the Moscow Times yesterday, Chinese investors have now proposed building a tunnel underneath the Kerch Strait instead of a bridge using expertise gained on a similar project in Macau. It would take 2.5 years and would not cost the Russian state any money upfront. The idea is likely to find favour. The Russians are already struggling to absorb Crime economically while building a bridge on the shifting sands of the Sea of Azov would be an enormous undertaking. The tunnel would contain two railway lines and a six lane road. roundup: NORWAY. The road surface is being blamed for a deadly bus crash earlier today. Three elderly Swiss passengers died after a coach veered off the E6 near Breakkvasselv, between Trondheim and Mo i Rana in central Norway. A local mayor told the press (via thelocal.no), ‘One of the greatest risks we expose ourselves to as humans is driving on the E6.’ The stretch had been resurfaced earlier this year but was apparently signed as slippery and bumpy. E6, the main north-south road through Norway, starts in southern Sweden and ends at Kirkenes near the Russian border, after 1950 miles. GIBRALTAR. The UK government is mulling a new plan by Spain to give frequent fliers special passes across the frontier to avoid often lengthy queues. The people set to benefit most are Spanish nationals working in Gibraltar.